Falcon is another name of perfection in terms of agricultural garden tools. Get very smooth and accurate cut with minimum effort. Easy to hold, handle, low maintenace cost and competitive pricing is the USP of this product range. Garden Pruner is fashioned with narrow, pointed cutting blades. It has hardened bolt and nut which ensures that both the cutting blades are well-adjusted. Rubber cushion and shock absorbers provides smooth, comfortable working and soft closing. Avail from us tree pruner, which has blades made out of special carbon steel hardened & tempered. These can also be ordered with or without handles as per the requirements of our clients. Our clients can avail these as per the current industrial standards. We are offering our clients with pruning secateur gardenia at highly competitive prices. These are manufactured as per the industrial standards keeping in mind the requirements of the clients. Moreover, we can provide these in customized sizes as per their varied client’s requirements. 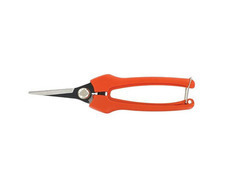 Clients can avail from us a high quality pruning secateurs anvil type Rolcut Pruners. We manufacture this tool with high precision in compliance with the industry standards.